Nearly half of the world’s population is at risk of infection by the dengue virus, yet there is no specific treatment for the disease. Now a therapy to protect people from the virus could finally be a step closer, thanks to a team at MIT. In a paper published online on April 8, 2013 in PNAS, the researchers, from MIT’s Koch Institute of Integrative Cancer Research, present a novel approach to developing a dengue therapy using mutated antibodies. According to a study by the International Research Consortium on Dengue Risk Assessment, Management, and Surveillance, up to 390 million people are infected with the dengue virus each year. For most people the mosquito-borne virus causes flu-like symptoms, including fever, headache, and joint pain. But for some, particularly children, the virus can develop into the far more serious dengue hemorrhagic fever, causing severe blood loss and even death. Despite the threat posed by the disease, developing a vaccine against dengue has so far proven challenging, according to Dr. Ram Sasisekharan, the Alfred H. Caspary Professor of Biological Engineering at MIT. That’s because dengue is not one virus but four different viruses, or serotypes, each of which must be neutralized by the vaccine. Protecting people from only one or some of the four viruses could cause them to develop the more severe form of dengue if they later become infected with one of the other serotypes, in a process known as antibody-dependent enhancement, Dr. Sasisekharan says. “That was the motivation for carrying out our study, to generate a fully neutralizing antibody that works for all four serotypes.” Efforts to develop a therapeutic antibody for dengue are focused on a part of the virus called the envelope protein. Johns Hopkins scientists have discovered how a gout-linked genetic mutation contributes to the disease: by causing a breakdown in a cellular pump that clears an acidic waste product from the bloodstream. By comparing this protein pump to a related protein involved in cystic fibrosis, the researchers also identified a compound that partially repairs the pump in laboratory tests. The mutation in question, known as Q141K, results from the simple exchange of one amino acid for another, but it prevents the protein ABCG2 from pumping uric acid waste out of the bloodstream and into urine. A buildup of uric acid in the blood can lead to its crystallization in joints, especially in the foot, causing excruciatingly painful gout. “The protein where the mutation occurs, ABCG2, is best known for its counterproductive activity in breast cancer patients, where it pumps anti-cancer drugs out of the tumor cells we are trying to kill,” says William Guggino, Ph.D., professor and director of the Department of Physiology at the Johns Hopkins University School of Medicine. “In kidney cells, though, ABCG2 is crucial for getting uric acid out of the body. What we figured out is exactly how a gout-causing genetic mutation inhibits ABCG2 function.” A description of the work with Q141K’s effects at the cellular level was published online on March 14, 2013 in PNAS. Gout affects 2 to 3 percent of Americans, approximately 6 million people. It usually involves sudden attacks of severe pain, often in the joint at the base of the big toe and frequently in the wee hours of the morning, when body temperature is lowest. A team of researchers, led by Marc Freeman, Ph.D., an early career scientist with the Howard Hughes Medical Institute and associate professor of neurobiology at the University of Massachusetts Medical School has discovered a gene in the fruit fly Drosophila melanogaster that, when mutant, blocks the self-destruction of damaged axons, which could hold clues to treating motor neuron diseases, such as amyotrophic lateral sclerosis (ALS), aslo known as Lou Gehrig’s disease. 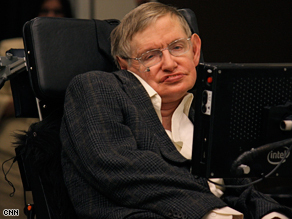 ALS also afflicts legendary physicist Dr. Stephen Hawking (photo). A neuron has a very distinctive form – a bush of dendrites that receive signals, an incredibly long axon, which is like a long tail, and "a little dot" between them that is the cell body, housing the genetic headquarters. Every part of the neuron is required for it to transmit messages. "If anything breaks along any part of the neuron, the cell unplugs from the circuit and no longer functions," explained Dr. Freeman, who presented this research at the Genetics Society of America's 54th Annual Drosophila Research Conference in Washington, D.C. The work was announced on April 8, 2013. Once the long tail-like axon is damaged, it shrivels away, basically self-destructing, and resulting in neurons that no longer operate. This catastrophic damage can happen in several ways: from inflammation, a neurodegenerative disease, a metabolic disorder such as diabetes, toxin exposure, or tumor growth. Such axon loss is thought to be a primary factor that leads to functional loss in patients with neurological disorders – it is equivalent to going into an electrical circuit and randomly cutting wires. As the body ages, the physical effects are notable; wrinkles in the skin appear, physical exertion becomes harder. But there are also less visible processes going on. Inside aging brains there is another phenomenon at work, which may contribute to age-related brain defects. In a paper published online on April 7, 2013 in the journal Nature Neuroscience, Cold Spring Harbor Laboratory (CSHL) Associate Professor Joshua Dubnau and colleagues show that so-called "jumping genes," or transposons, increase in abundance and activity in the brains of fruit flies as they age. Originally discovered at CSHL by eventual Nobel Prize winner Professor Barbara McClintock (photo) while working on maize (corn) in the 1940s, transposons are typically repeat DNA sequences that insert themselves into the DNA of an animal or plant. The moniker "jumping genes" comes from the fact that, when activated, transposons can reinsert themselves, or transpose, into another part of the genome. In the course of doing so, they are thought to either provide variations in genetic function or, especially in the germline, induce potentially fatal disruptive defects. The lifespan of a fruit fly can be measured in days. The average fruit fly lives for somewhere between 40-50 days. But these flies provide a powerful model with which to get at the genetics of phenomena like aging and brain function, including memory. Dr. Dubnau's interest was piqued by an experiment in which his team showed that when the activity of a protein called Ago2 (Argonaute 2) was perturbed, so was long-term memory—which was tested using a trained Pavolvian response to smell. "This is a neurodegenerative defect that gets profoundly more apparent with age of the flies," notes Dr. Dubnau.